Update I: It has been brought to my attention that the previous photo of Hillary Clinton has the subliminal symbol of Communism over it. I shall investigate immediately! Update II: Ok, I'm done. I've concluded that "this was a technological malfunction" and not an issue of conservative photoshopper revenge at all. 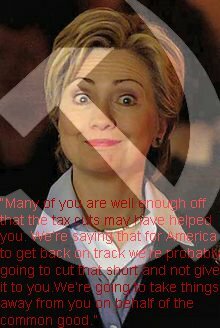 I know, I know, I was heard bwahahahahaing while putting the quote on Hillary's image in photoshop but you see, I bwahaha all the time making that a non-issue. This is merely due to all of that coffee I drink. And yes, I know I often show my bias by calling Hillary Clinton "The Hildabeast" but that proves nothing, even google knows who "The Hildabeast" is. Try googling a misspelling of that "pet name" and see google ask "Did you mean Hildabeast?" then click that to see that everyone else knows who "The Hildabeast" is as well. It's all out of love, really. Anywho, back to my lame excuse, er...I mean the technological malfunction. My cat stepped on the keyboard, momentary glitch, yadda, yadda. I obviously regret that it happened and am working to ensure that this is not repeated. Until some other liberal says something totally communist anyhow.